We developed Clearing Assisted Scattering Tomography (CAST) to address today’s demand for investigating intact complex biological systems. The speed of traditional fluorescence methods is ultimately limited by the finite fluorescence photon yield. Without suffering from photo-bleaching, elastic scattering, measured with optical frequency domain imaging (OFDI) or optical coherence tomography (OCT), enables a much higher imaging throughput. Although deeper than confocal (tens of micron) and two-photon microscopy (hundreds of micron), imaging depth of current OFDI/OCT is limited to 1~2 millimeters by tissue scattering, and has prevented imaging deep into an intact brain. By combining tissue clearing to control photon scattering and employing an optimized OFDI apparatus, CAST enables high resolution, volumetric imaging through thick intact tissue without any fluorophore or chromophore labeling. The significant merits of this new method lie in that it provides a unique high-throughput approach to imaging deep inside tissue at optical resolution. By detecting light coherently, CAST is fundamentally distinct from other existing methods based on incoherent detection. This allows the measurement of not only the intensity but also subtle characteristics of light such as phase and polarization, opening the possibility of exploring a wide spectrum of contrast mechanisms in cleared tissue. Since it scans samples non-invasively, CAST is compatible with subsequent targeted, higher resolution investigation of biological structure with other modalities. Considering the significantly faster volume image acquisition, a possible role for CAST may be for fast in-process monitoring during high-throughput studies and rapid pre-screening prior to the application of higher resolution imaging requiring exogenous labeling. Ren, J., Choi, H., Chung, K. & Bouma, B.E. 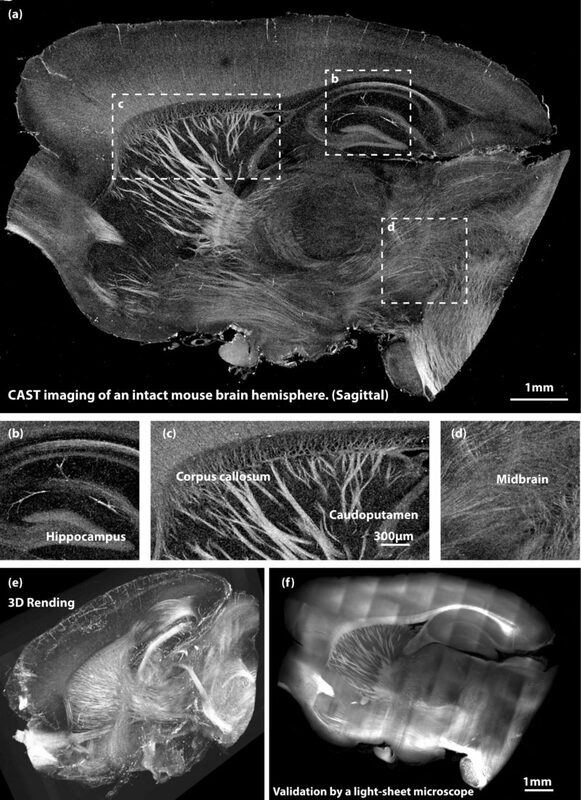 Label-free volumetric optical imaging of intact murine brains. Scientific Reports 7, 46306 (2017).